Online Registration is closing Friday, August 25th, at noon! You can still register in person Friday night, 6-8 pm at St. Luke's Anglican Church Hall(340 St. George Street, Annapolis Royal) or Saturday morning at 8:30 am at Fort Anne. 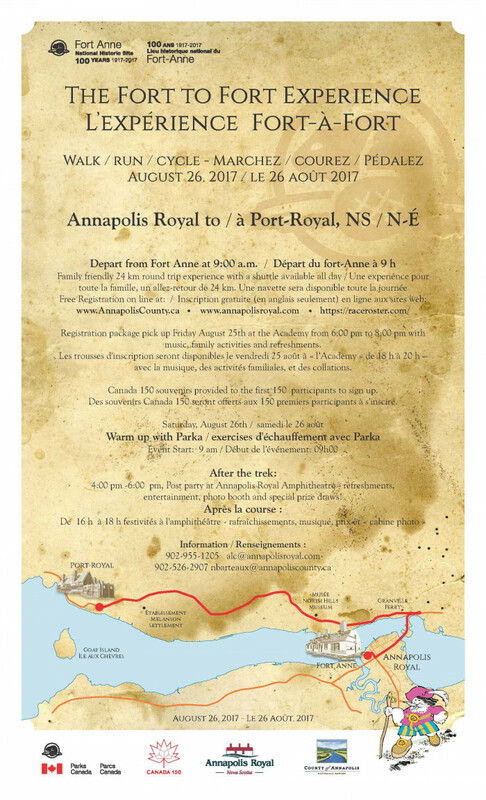 The County of Annapolis, the Town of Annapolis Royal and Parks Canada are inviting you to walk, run or bike Fort-to-Fort! We'll start at Fort Anne National Historic Site of Canada (Annapolis Royal), make our way to Port-Royal National Historic Site of Canada (Port Royal), and back again (24 km). Enjoy the beautiful sites along the way...all in celebration of Canada's 150th. There will be entertainment, refreshments and tons of fun. A shuttle will be made available throughout the day. A post celebration party will take place afterwards at the new amphitheatre in Annapolis Royal where you can enjoy entertainment, refreshments and a photo booth for a souvenir picture. A "Good Cheer" pre-party is planned where you pick up your registration package and enjoy family activities at the Academy. There will be Canada 150 souvenirs available to participants. Pre-registration is required to this FREE event. It's a family event that everyone can take part in and enjoy!!! Walk, run or bike "Fort to Fort"
The County of Annapolis, the Town of Annapolis Royal and Parks Canada are inviting you to walk, run or bike Fort-to-Fort! We'll start at Fort Anne National Historic Site of Canada (Annapolis Royal), make our way to Port-Royal National Historic Site of Canada (Port Royal), and back again (24 km). Enjoy the beautiful sites along the way...all in celebration of Canada's 150th. There will be entertainment, refreshments and tons of fun. A shuttle will be made available throughout the day. A post celebration party will take place afterwards (4-6 pm) at the new amphitheatre in Annapolis Royal where you can enjoy entertainment, refreshments and a photo booth for a souvenir picture. A "Good Cheer" pre-party is planned for Friday, August 25th, 6-8 pm, where you pick up your registration package and enjoy family activities at the Academy. There will be Canada 150 souvenirs available to participants.